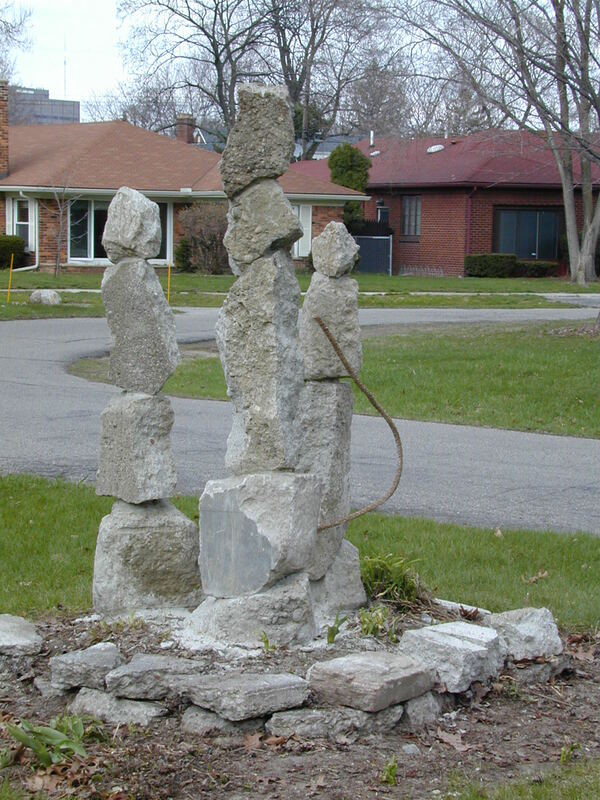 Detroit, MI – May 7, 2004 – Matthew Loflin Davis recently completed his first permanent, public rock sculpture installation, in Southfield's Magnolia neighborhood. The three slender vertical stacks were installed in a public space near Hollywood and Magnolia Parkway. The stacks are set on concrete foundations, and the rocks are held together with steel reinforcing bars and mortar. "The piece, which is entitled 'Respect,' is a unique complement to the neighborhood and symbolizes the essence of our community - respect for each other and for the beauty of the environment," said area resident Skip Davis. "Neighbors agree that the sculpture brings pride and a feeling of 'family' to the area." Magnolia neighbors Ken Siver and Skip Davis (who is unrelated to Matthew) drove the effort to get the installation built, and, along with several other area residents, helped to finance the project. "This project represented a perfect opportunity," Matthew Davis explained. "By allowing me to create permanent sculptures in a public place, and to test my ideas about how best to hold such sculptures together. The Magnolia neighborhood installation was the testbed for my ideas on how to create a permanent installation on Belle Isle, and it turned out beautifully - both from an aesthetic and a permanence standpoint." Matthew was referring to his ongoing efforts to work with the city on a proposal concerning a permanent installation of his work on Belle Isle. Although the proposal was first submitted to the recreation department on February 26, 2004, Matthew has yet to receive any feedback on it, and is unsure what to make of the city's lack of response. "Last year, the city first commended me on the Belle Isle sculptures, then threatened to tear them down because of alleged safety concerns, even though the sculptures are far less dangerous than the thousands of abandoned buildings that the city is responsible for," explained Matthew. "Now, I've submitted a proposal for a safe, permanent installation--which literally thousands of Detroiters have voiced support for--and I've proven, at Magnolia, that the reinforcing technique works, yet the Recreation Department won't get back to me with an answer, after almost three months from my submission of an official proposal. I swear, I love and will always love Detroit, but having to deal with the city bureaucracy really makes you understand the challenges we face in becoming a 'cool city'." The Magnolia installation can be viewed at the intersection of Hollywood and Magnolia Parkway in Southfield. Supporters of Matthew's efforts to construct a permanent installation on Belle Isle are encouraged to contact Charles Beckham, Director of the Detroit Recreation Department, at 313.224.1123, to voice their support. Matthew Loflin Davis, a well-known Detroit-area sculptor and photographer, has received overwhelming public support for his work on Belle Isle—so much so that the Mayor’s office intervened to keep his installation there standing when the Detroit Recreation department threatened to take it down. Davis has been featured several times on WJBK Channel 2 news in Detroit, was the subject of an episode of Art Beat on WTVS Detroit, was interviewed on WMTV5's Positively Positive, and his work has been covered by WDIV Channel 4 news, the Detroit Free Press, the Ann Arbor News, the Holland Sentinel, and other newspapers nationally. Several Detroit-area art lovers have commissioned him to do stone and metal sculptures. For more information on Matthew Loflin Davis and his work, visit www.mldavis.com. For more information on the Magnolia installation, click here. For more information on APLAUDD: Art for Public Life And Urban Development in Detroit, a group that Davis co-founded, visit www.aplaudd.org. For more information on Mars Industries, visit http://www.marsindustries.com/. Copyright © 2004 by Matthew Loflin Davis. All rights reserved.